Some people get the urge to bake cookies and goodies around the holidays. But I prefer to get cooking on my playdough projects! These colorful balls of dough goodness are are also delightfully scented. This picture shows fruit punch, orange, lemonade, lime, blue raspberry, and grape. Cook over medium heat 3 to 5 minutes until it forms into a ball. I like to squish it around a bit in the pan just to make sure there are no runny or "raw" parts. Then I dump it on a plate to cool slightly. As soon as it is cool enough to touch I knead it around a bit to form a ball. Then I can also tell if it is uncooked and needs to go back in the pot. When it is cooled I put the balls in a zip top bag or lidded glass or plastic container. They keep for a month or tow. They keep even longer when stored in the fridge though it might hastened the drying process a bit. But dry dough is much better than moldy dough! Alternatives: You can also experiment with different scents and ingredients. When we didn't have kool-aid on hand we used food coloring and whatever scented ingredients were available. We've successfully used coffee grounds, cinnamon, vanilla, mint flavoring, lemon flavoring, cocoa powder, and lemonade mix as scent substitutes. Off topic: I would love to try some with lavender oil. But I got rid of all essential oils in the house after a call to poison control! Granted, it's been 5 years since my influx of calls into the poison control center. But I think the memories of living with a highly-mobile sensory-seeking toddler who foiled all childproofing and mouthed everything scarred me for life! Did you know tomato plants are toxic? I ripped out every plant or shrub from our property that was not edible. Tip: Skip the small container of cream of tartar! 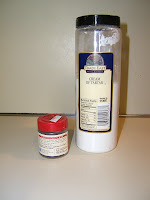 Consider buying the bulk size cream of tartar from someplace like Sam's Club, Costco, Gordon's Food Service, etc. You will quickly run through a small spice jar for just one or two batches. So it is much more economical to buy the bulk size. One last tip: Don't be fooled!! If you have a specific color of playdough in mind READ the package ingredients to find out what colors are used. Also look for any special notations on the package like "color-changing" or "mystery color." The color of the kool-aid package does NOT always match the color of the contents! There was one package of koolaid whose mix was one color in the package andt actually turned a completely different color when it was wet. A second last tip: I found that some flavors of kool-aid smell less pleasant than others when cooked. Sour apple comes to mind! But then again some people like my husband can't stand the smell of ordinary playdough. Just give yourself time to experiment and try not to make them for last minute gifts in case one flavor ends up being stinky!